We were given a two hour season finale and they used every single minute to explore time travel, finally allow Emma to realize that she has a home and a family who care about her and also to yet again hurt Regina. Everything Regina has worked so hard for in this entire season seems to be about to be unraveled. And at the very end we were shown that The Snow Queen is in town, a revelation I am slightly worried about but more on that later. I loved this finale because it was fun to watch and did a great job at giving us some throw back moments to season one while also allowing one of our major characters to really grow. I knew that time travel would have to make an appearance in this episode in some manner. They couldn’t introduce the idea, get so close to it happening and then not use it in any manner. I was worried that we were going to spend the episode trying to close the portal and end up traveling through time as our cliff hanger. An entire season trying to fix time mistakes would have gotten extremely complicated and convoluted. You can only mess with so much until you have a tangled mess that has nowhere to go. I like the way they used the concept in this finale though. We used it to allow Emma to learn something that she has been refusing to understand for so long. Emma finally saw for herself that Storybrooke has everything she ever wanted. Storybrooke is her home and that is what matters in the end. The episode began with a glimpse into the past. Teenage Emma watches as one of the members of her group home goes off to live with her new family. Yet again Emma is left alone and feeling broken hearted. She hates being the one who is left behind. She is told she will get a home soon, but that never becomes true. Emma never finds that home and because of that she stops believing that home is a concept she can ever truly have for herself. All Emma ever wanted was a home and a loving family, which is why she has been driving me crazy for this last half of the season. Standing right in front of her is everything she has ever wanted in life; a family, a home, and somewhere where she can feel wanted and loved. Yet she refuses to see what is staring her directly in the face. Everyone gangs up on Emma when they find out her plans to return to New York. She runs off, frustrated because no one understands why she wants to leave so badly. Henry gives Hook the storybook hoping that it will help his mother remember what she has here in this town. The book literally holds all the stories that have led to her life as it is now. When Hook confronted Emma he asked her a very simple, yet specific question. “What are you looking for?” With one question Hook sums up this whole half of the season. What does Emma want? Why does she continuously run? What is she scared of? What is it that will make her feel complete and happy? This whole season I have been asking myself that same question about Emma. What does she truly want? Emma opens the book and says that she doesn’t feel like she is apart of this world. She says this is a book full of fairytales, princes and princesses, concepts that don’t include her and never have included her. Emma reacts like many of us would if we were told that our family are fairytales characters; we wouldn’t believe it and would have trouble reconciling the idea. To us, this is an impossible life, one we can never truly hope to live. For Emma the idea of having this family is the impossible idea, no matter who they are or where they have come from. Emma has never truly been apart of anything. She has always felt like an outsider, never a main character. Now she is scared to be put into that position, scared to be put into the spotlight. Emma is scared to take what is being presented to her because she doesn’t understand it in any manner. I firmly believe Emma has been terrified of giving into this new life because of how easily she could lose all of it. She has this comfort zone, the outskirts or supporting character. She keeps people at arms length all the time. It took her a very long time to let Henry in and now she is expected to let the rest of these people in as well. Opening up her heart to these people could get her hurt; see Regina as an example. But then she thinks she sees Snow die and she realizes what she has had all this time. I love that she defines home by a statement Neal once said to her, “Home is the place when you leave you just miss it.” All these years she has been defining home from someone who was an intricate part of this world she is trying to run away from. She can’t escape this life, no matter how hard she tries. She is using a fairytale characters definition of home to define her happiness, slightly ironic because of how much she tries to not be part of the fairytale world. She is meant to be a part of this world and always has been. 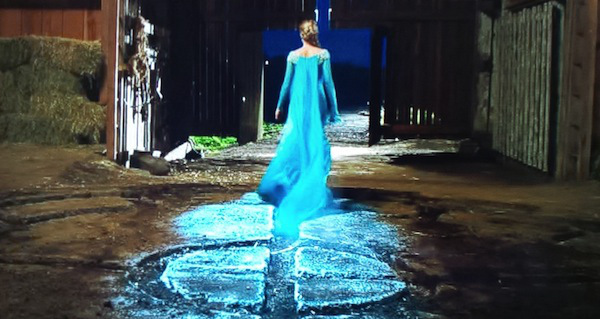 The time travel aspect of this episode was used to show Emma that Storybrooke is where she belongs. She has always been apart of these stories. This is her life if she is willing to let it be her life. 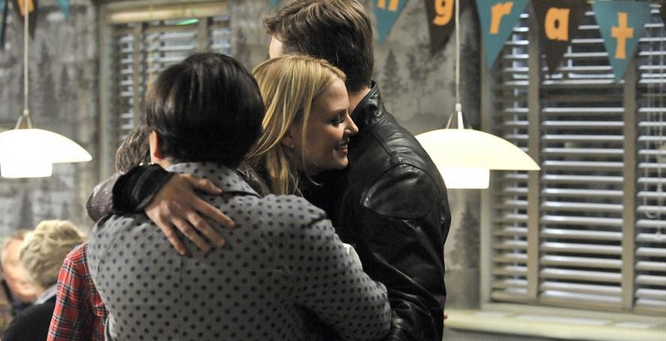 Emma gets to see her parents go through trials and tribulations to end up together. She sees how real they are finally. After her heart breaks because she believes that Snow dies she finally sees what she has, a family. She has parents who love her and it takes this whole process of almost losing everything to realize what life has put in front of her. As always you don’t realize what you have until you lose it. Thankfully Emma didn’t have to permanently lose her mother to learn this lesson. Emma returns to Storybrooke able to open her heart to her parents and in the end hopefully opening up her life to real and true love. Unfortunately for Regina we see that putting her heart on the line does not end well for her. As soon as Emma released the unnamed prisoner I knew she Marian. The conversation in the beginning of the episode between Robin Hood and Regina foreshadowed this twist. We see him talking about losing his wife and coming to terms with it and now that wife is back. I waited anxiously for the reveal and it really did break my heart. Regina has had to work so hard to get to this point in her life. She had to not only forgive Snow and walk away from her plans of revenge but she also had to accept Snow has a friend as well as many of the other residents of this town. Regina stopped living for destruction and began to live for love first through Henry and then with Robin Hood. She literally handed her heart to Robin Hood for safe keeping. She finally completely opened herself up to love and happiness. Watching her walk down the street with Robin and his son was heart warming. And then they completely snatched everything away from her. Clearly Robin still loves his wife. Once again Regina is going to be displaced. This whole thing has the theme of history repeating itself running through it. Like mother like daughter; Emma accidentally destroys Regina’s chance at true love. And we see that Regina is not at all happy with Emma and her actions. I sincerely hope that Regina’s character doesn’t backslide into the hate/revenge filled woman from the early seasons. She has come so far it would be horrible to watch her fall right back to the bottom again. We’ve done that story with her many times before. Hopefully they find a way to make this just a small setback in Regina’s growth story. Maybe they can have some way of not having Marian being able to stay in this time because of some time travel rules. And ideas is to have Marian fade away and having Robin have to lose her all over again. This would not only build up Robin’s character but could put Regina’s character into a new light. Regina has to stand back and be a friend to Robin, be there to talk to but not be his lover. As he loses his wife again she has to, selflessly, comfort and help him. This would build Regina up even more. Having her revert to her old ways would be disappointing to watch. Regina tells Emma she better, “Hope to hell you didn’t bring anything else back,” and we see very quickly that Regina wasn’t off with her suspicions. In the last moments of this episode we see the Snow Queen make her first appearance. Now while watching this last moment me and my brother both screamed, “Elsa,” when she appeared on screen. “Frozen” is one of my favorite Disney movies. It was a refreshing take on the princess story line that Disney has done so many times. That being said I sincerely hope they don’t end up trying to just retell the movie storyline next season. Though I was a little worried about the OZ storyline and that was done very well. If they keep up the way they tell these stories we should be okay. I have the full works of Hans Christian Anderson and I read “The Snow Queen,” after I saw “Frozen.” The original Snow Queen isn’t a friendly woman, she is cold and evil. She isn’t Elsa. That leaves the writers with two choices when it comes to this storyline. They can use the original story and make the queen the new villain. She can be cold and pure evil, which would not be a bad thing. We’ve had our true villains, Zelena and Pan, who we were able to hate and not want to see redeemed or win in any way. But both had past stories that made them the way they were. Stories that still had moments when we felt bad for them. We haven’t had a purely evil character yet. Someone who is just evil to be evil. Or they can go alone the lines of the “Frozen,” move and have the Snow Queen become a strong woman. She can start off as evil and slowly change, (much like Regina). We can watch her become more of an Elsa type character. A possible idea is to have her be enslaved to her power, (through curse or some other power) and she has to break free. She is trapped by not knowing how to control or use her power, making her angry at the world. In “Frozen,” Elsa hid away from the world but in the show maybe she can fight for her freedom. That would be interesting to watch someone enslaved to something outside of themselves and have to use the people around her to help her fight and win her life back. Then she can become a new main character as well. I loved this finale. We got a taste of time travel that was full of suspense and “Dammit Emma,” moments while not spinning out of control. We watched as Emma finally grew up and accepted her home and family. Regina has taken another blow but she is a resilient woman and I believe she will bounce back stronger then before. And in the final scenes we are given a new character that can have a lot of potential to give us a new and exciting season. “Maybe things work out when they’re supposed to. Maybe it’s about timing,”- Robin Hood- Interesting phrasing considering what happens later. How does this idea apply when time is messed with? Can Marian stay in this time without consequences? “Not Regina, the evil queen”- Hook – I love that Hook makes this distinction. Regina and the evil queen are no longer the same person. Hopefully Regina realizes this as well. “Interesting choice of words”- Neal- Emma’s life has always been about these stories even if she never saw this connection before. “Only one who saves me, is me”- Emma- Emma is strong and has to find her own way to her home. She had to see with her own eyes where she truly belongs. People can only talk at her so much. “All actions have consequences”- Regina- Unfortunately this is a concept that Regina understands way too well. “I’ve not spent my life losing you. I’ve spent my life finding you”- Belle How true will that be when she finds out what Rumble has done and how he has lied to her? She is going to be broken hearted but can she still trust Rumple? Who will this Snow Queen be? Will she have a connection to anyone else? Why was she trapped by Rumple? What is next for Regina? Will she begin to hate Emma again? Will she hold onto Robin has a friend? Can Regina walk away if she has to? Can Marian stay in this time? Will it create a paradoxe? What will happen when Belle learns about Rumple lying? Will she walk away for good? Are there any other consequences form the time travel trip? Posted on May 12, 2014, in Once Upon a Time, Tv Shows and tagged Elsa, Emma, family, Frozen, love, Once Upon a time, Regina, Robin Hood, Season finale, Snow Drift, There's no place like home. Bookmark the permalink. Leave a comment.